During the first two years of life, babies begin to develop their first set of teeth – their primary teeth. This period is an extremely important one for building good oral health habits. These early years can often be a confusing time for parents (especially for first-time parents) when it comes to oral health care. The Smile Town North Delta Team is here to give parents have all the information they need to keep their babies’ new teeth healthy as the grow. The information and tips below will help you navigate your baby’s first years from an oral health perspective. Teething is the process of your child’s baby (primary) teeth growing in, and usually begins around 6 months of age. Most kids have their full set of primary teeth by the age of 3.
talk to your doctor or pharmacist about prescribing a mild painkiller if your child is extremely uncomfortable. Tooth decay must go on your list of things to deal with as soon as your child's baby teeth begin to erupt. Most of the nutrients your child ingests during his or her first 6 months – be they from breast milk, formula, cow's milk, or fruit juice – contain sugar. And many of the solid foods you’ll start introducing at the 6-month point will also contain sugar. These sugary foods combined with frequent and prolonged exposure (for instance, if your baby goes to bed with a bottle or sippy cup), and tooth decay can become a real problem for your teething baby. 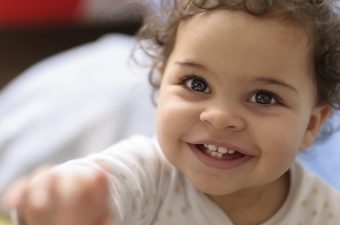 Even at this early stage, taking care of your baby’s teeth and gums is extremely important. within 6 months of the eruption of the first tooth, or before his or her first birthday, start bringing your child to the dentist regularly for checkups and cleanings. Above all, there's no need to feel stressed! If you get your baby on a regular oral care schedule following these easy steps, you’ll be fine. And if you need some guidance, feel free to get in touch with your Smile Town North Delta Team; we’ll be happy to answer any questions you may have.